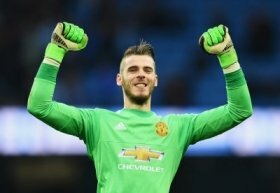 Spanish goalkeeper David de Gea has reportedly been left out of the Manchester United due to face Arsenal in the FA Cup fourth round tonight. The shot-stopper has returned to his old self in the past few weeks and he most recently made 11 second half saves in United's 1-0 league triumph at Tottenham Hotspur. Despite this, manager Ole Gunnar Solskjaer has decided to rest the Spaniard for the Cup tie with Sergio Romero expected to feature between the sticks on Friday, The Mirror reports. Meanwhile, skipper Antonio Valencia has likewise been left out of the mix despite being fit and reports indicate that he has already been told that he has no future with the club. The Ecuador international has been a brilliant servant for United over the years but he has fallen down the pecking order this term with Diogo Dalot and Ashley Young preferred ahead of him on the right side of the defence.